This route is a mix of gravel road, paved road and the gravel KATY trail that begins in St. Charles county at the famed "Mound" parking lot. Offering over 1,800 feet of elevation, expect to take 3-4 hours to complete this ride. The route's furthest point is in Augusta with the remainder of the ride bringing you back via the KATY and hamburg gravel trails. The main feature of this route is the gravel climb on Osage Ridge Road. Leaving the "Mound" at Weldon Spring, head down the Hamburg trail alongside Hwy 94 and take the KATY trail to Defiance Road. Next, take a left onto F to a left onto Femme Osage Creek Road. You will make a left onto Osage Ridge Road, but it does have a sign so just be on the lookout. Once you climb up the Terry-esque gravel climb, the road will top out and ride the ridge for quite a while. This gravel will dump you onto Hwy T. Take Hwy T for a short section and make a left onto Nahm Rd, which is gravel. This will connect you to Hwy 94 just across from the main drag into Augusta. Go through Augusta and drop back down onto the Katy. From here, you can get back to the "Mound" any number of ways with various levels of difficulty. 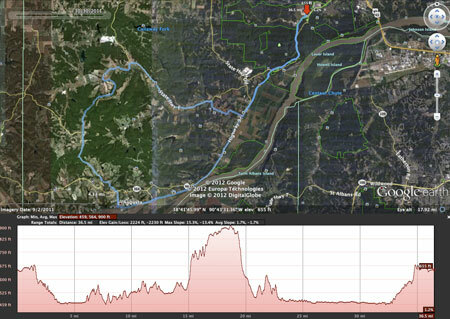 This GPS track takes the KATY back to the Hamburg, but you could climb Terry or Duke to make it more challenging and you could go through Lost Valley to get in two more climbs on the way back, too. Yes, there is some pavement on this route, but with the Katy, Hamburg, Osage Ridge Road and Nahm Rd., there's plenty of gravel. Great turnout on Peat's Hip Ride. Femme Osage always green.